Dear June, where did you go? Time for the June update! 1. Clean, de-clutter, paint, re-carpet, fix ceiling, and organize Paige's room. This room is an unorganized disaster that needs some serious help. Plus she is at that age where she is growing out of everything: clothes, toys, books, etc. We are doing a lot more decluttering than I planned. Which is great! She has gotten rid of a lot of clothes, shoes, and toys. We have a little bit more to do, then we can find the carpet completely and clean it to see if we can make it work. We also picked up another headboard and bed frame (for free) to replace the bed we are moving to her room. 2. Clean, organize, paint, and re-carpet the office. This is where I work at home (most of the time). It doesn't work for me. It doesn't really work for anyone. I have been doing some serious reorganization in the office. A lot has left the office including all my personal books which are in my room now on shelves. I am working on going through everything to see if it needs to stay or go. 3. Purchase a hand gun and learn to use it well. 4. To blog much more consistently and to learn to use social media to my advantage. To me consistently is at least 3-5 times a week. That doesn't happen right now. I am learning a lot about everything blogging and I am really excited to implement what I can. You might have seen some of the changes like the pop-up to subscribe to emails from me and larger writing which is easier to read. I am learning more and more about social media and using it. I am also learning about quality over quantity which means I would rather put out one great post a week over three mediocre ones. 5. To make a homemade gift for each birthday. I have lots of ideas that I am not using right now so this should be easy to do. 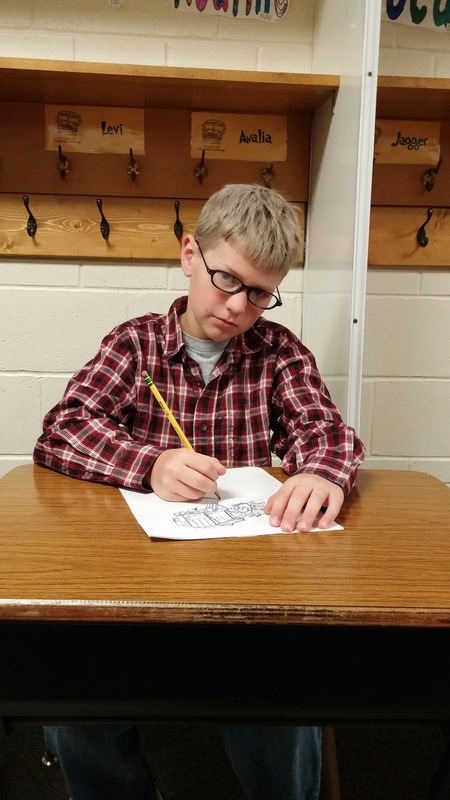 I have Dane's 11th birthday coming up and I am seriously stumped. Ideas? 6. Add 1-2 beehives to the homestead. I would love, love, love to produce our own honey. Not happening this year. 7. Lose 20 pounds over the year. Unbelievably, I love 20 pounds last year and would love to lose 20 more this year. Still working on that too! I am staying active, but working on some dietary changes. I am working on being more conscious of the sugar carbs I consume. 8. Finish six unfinished projects. I will introduce you all to my needlework pile in the future. You might not be laughing after you see it. One project is done (curtains) and we have the other just about done. We redid and restrengthened the bunk beds that were at my house for Rob's house for the kids to sleep on. They will be done by Friday! Yeah! 9. Live as frugally as possible by making more my own things and using what I have first before buying more. This really needs to happen this year and working up a realistic budget will be the first step. I have the budget and it has been ridiculously easy to stick to so far. Summer is always hard on my budget so this should be interesting to see how easy this is. I am also putting aside $20 cash from each paycheck and all my egg money for a rainy day cash fund. So far, so good! 10. Write a book or an e-book. Because I have always wanted to. 11. Go to a self-reliance/preparedness expo and/or Mother Earth News Fair. I have never been to one and always say I want to go one and never do. This year is the year for this! 12. Get a new-to-me double recliner and love seat for the living room. The ones I have have been blessing my home for at least 16-19 years and they blessed some one else's home before that. The kids have made sure they are worn out and broken down. I have fixed over and over again. Enough. Time for new to me stuff! Still looking for these too. I need to start going to auctions! That is where I am at for the progress. I know I don't get a lot done every month, but progress is progress. July is a lot more calmer for us even though the kids are going to church camps and have 4-H fair coming up. I hope to get a lot more done! May was a busy, busy month. First of all, this one graduated! Jordan graduated from high school on the 17th with a big party on the 16th. We were pretty busy with that. And when we weren't busy with that, we were busy with Dane's big school project. His school has the fourth graders do a wax museum every year complete with a board, essay, and presentation as well as a walk through for the public. Dane was George Lucas this year which was perfect because he loves Star Wars! Paige had concerts, track meets, track being over, and softball starting. She is always busy! 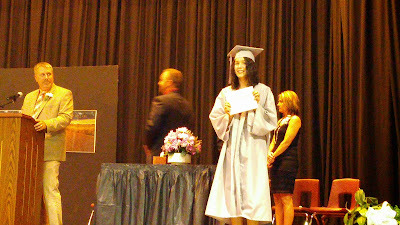 She is looking forward to becoming a high school student next fall. I am just sure her momma is! Otherwise, here is the update for the goals! I didn't touch it. That is on tap to be done when school gets out (which is today!). I have been cleaning out and reorganizing. I am getting rid of a fair amount of books, moved most of my library down to shelves in my room, and got rid of a set of shelves that were holding binders. I tossed most of the binders' contents. I am getting rid of a desk in the office which will go to Dane's room since he does not have a desk. Getting better! Three posts published last week! 6. Add 1-2 beehives to the homestead. I would love, love, love to produce our own honey. We have gone back to once a month shopping and menu plans for the entire month. I did the shopping trip two weeks ago with a small trip last week to pick up what Aldi's did not have. So far, so good! I save so much money this way. The garden is going in this week. I planted onions and asparagus last week. I will also be weeding and putting up rhubarb this week. I bought some older bananas last week which are perfect for dried bananas. The kids love them! This has been on hold for the last month. Between remodeling my work office and very busy month for her, we haven't gotten a lot done. We might just wait until school gets out before really taking this project seriously. My home office has been getting tackled. I have cleaned out a lot of stuff straight to the dumpster. I also moved a set of shelves that were empty into the bathroom. I was home for a week with a sick child and just really did some cleaning out of this room. Still needs more done though. Still been working on social media! I now have an Instagram account so feel free to add me there. I hit a bit of a stumbling block on blogging consistently with Dane being sick for a week, but hopefully now I am back on track. Next birthday is in August. I have time to figure out what. 7. Lose 20 pounds over the year. Unbelievably, I lost 20 pounds last year and would love to lose 20 more this year. I think I need to up our grocery/household budget or get more creative with the grocery/household budget. The kids have been taking more sack lunches to school which has added a little cost. We are also becoming more aware of what is going in our mouths as well as the pets' mouths which is increasing the budget too. I need to rework my budget in May. We also have a graduation to pay for. Yikes! I got a new entertainment center for the living room for $60. I know this was not part of the goals, but it was $60 and it fits in the corner. It can also accommodate a bigger television and ours is dying. Still looking for a double recliner. I am horrible about my goals. However, they are goals which are just defined dreams. Hopefully though, we can get them accomplished! March was a whirlwind. Between the illnesses and busyness, we did the best we could. We probably ate out too many times, but life is like that sometimes. A tax refund helped cover that cost! We are still cleaning out, decluttering, and reorganizing. Amazingly, she is doing some of this on her own. I hope to really get this done in the next few weeks. I want to figure out if we can save the carpet or if we need to replace it. I am doing a little bit every night. I actually found some of my desk. The organizing of some things are coming together, like having passwords, addresses, and phone numbers in the same place and book. Amazing what that has done for me! I will be doing this in April. I have one from a friend that I am considering purchasing. I would like to fire it first, but the size is perfect for what I am looking for. More hopefully next month! Blogging was going great until I got sick. Then I had a 12 day dry spell. However, I kept up on social media. I post on Facebook 3-4 times a days, Google+ 1-2 times a day, Twitter 1-2 times a day, and Pinterest 1-5 times a day. This does take up a little time, but I love interacting with all of you! I am still working on Shali's gift. I ran into a glitch and hope to have it done soon. This is still in the research stage. I would love to have beehives, but I am not sure we have the environment to support them. I may have to plant more bushes and flowers to give them more pollen. I am surrounded by corn and bean fields and I don't think that will help the bees either. I am maintaining which is better than gaining. I am focusing on moving more and eating better. I am still at the needlework projects. I love the time I spend doing it because I relax for a while. I find it a great way to unwind at night. I paid off a lot of bills with the tax refund. I was making payments on a few bills and they are gone. I also took advantage of a meat sale at Fareway and now have a fuller freezer. I also used some of the money to restock the pantry. I love having a full pantry! I am looking for a good deal. I don't want new furniture and I don't want to pay new prices. I am being patient. I did score a full/queen size metal bed frame to replace the one in Shali's old room for $30. Yeah! That is March in a nutshell. Here's to April! February was a rough month for us with kids having colds and sinus infections. The ones who did not catch them were doing everything in their power to not catch them. We also had basketball tournaments 3 out of 4 weekends. That will kill getting anything done! We are in the process of cleaning and decluttering her room. We set a timer for 20 minutes most nights and tackle what we can. A lot has gone already, but more will be gone. We could probably have a garage sale at this point, but no time for that. Nothing. Working on #1 first. That didn't happen this month. I am learning I need a scheduler and to carve out some time. Mornings work better than anything so I will be getting up earlier. Working on Shali's! Her birthday is Thursday! Yeah! Still at the same weight. I need to get moving more. I have about 7-8 pieces like this done, but I really am trying to use up this entire sheet of paper canvas. It should be able to get 3-4 more Christmas-like things out of it. Maybe by the end of March, I will. We are working towards this. However, my need to stockpile has been kicking into high gear. I make as much as I can of my own things. Produce waste has gone way down this month. I am thrilled with that! That is it for the month of February. Hopefully, Spring will come in March and I will be able to get some more of these tackled. That and my tax refund should be here by the end of the month. That will help on the purchasing end of things. I can say this: not much happened this month. I did do a lot of planning and came up with a plan of attack for the first goal. Most of the rest of the goals have been researched and are being worked on. Like I said before, I now have a plan of attack. Unfortunately, this plan of attack also includes Shali's old bedroom across the hall. Which wasn't in my original plans. I am on the hunt for shelves for Paige's room and a queen size bed for the other bedroom so we can move the full size bed to Paige's room. Paige also started decluttering and got rid of a lot of clothes! Yeah! More needs to be done, but this is a start. I will tackle this after Paige's room. However, the need to organize the Ebay inventory is starting to become a necessity. I think I may have shelves in the barn to deal with this. I hope. Still researching, but I think a 9mm might be the winner due to size and lightness. Still working on this. I will always be working on this. The blog took a break for ten days due to my schedule and energy level. However, I am still busy, but feeling better. I stuck to using social media and promoting this blog. This is taking some time too. I might have to look into a scheduler. I am working on Shali's birthday present. She will be 20 in March! I have a kit and some books picked out on Amazon. I am still debating on what to use and how many. Nothing lost, but nothing gained either. Jordan decided to buy a scale for the house and that should help to keep track of the weight. 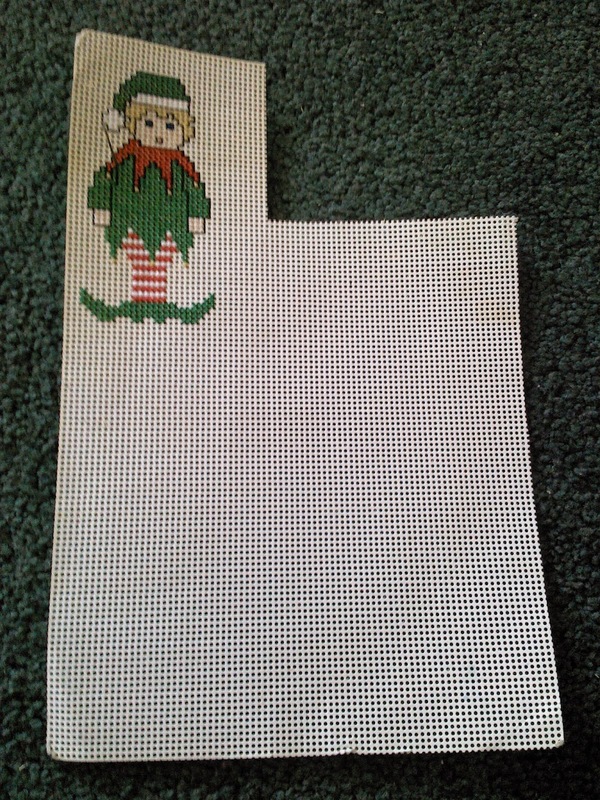 I did work on some needlework this last month, but forgot to take a picture. I will try to do so in the future! We are trying. We really are. We did eat out a few times due to Paige's basketball games getting over late. However, I am really trying to meal plan and have supper in the slow cooker. Nope, nothing here yet. I have ideas, but nothing concrete. Nothing here yet either. I know there is one in Florida in two weekends and it would be awesome to go. Florida just seems a bit far to go right now. I have been surfing Craigslist and Facebook sale sites, but no luck yet. I will be patient! Hopefully we will see some real progress in the next month! Making a Budget: No One Wants To, But We Need To! In the 13 Ways To Save Money In The New Year post, point #13 was to find someone to be an accountability partner for spending and budget making ideas. Before you can look for an accountability partner, you need to do something first. You need to make a budget. I know, I know. Making a budget is really, really, really hard. I know because I struggle with it too. However, I am determined to make a budget this year, adjust it when necessary, and stick to it. I have to give my money a place to go and I have to keep a tighter eye on where it is going. Making a budget is not an overnight project. You need to look at the last 2-3 months and determine your expenses (bills, groceries, gas, etc.). How much, where, and frequency of money being spent is all things that need to be noted. How much money you make and frequency of money being paid to you needs to be noted. From these things, make a budget. You can use a computer program or go low-tech (like me) and use a notebook or a planner. 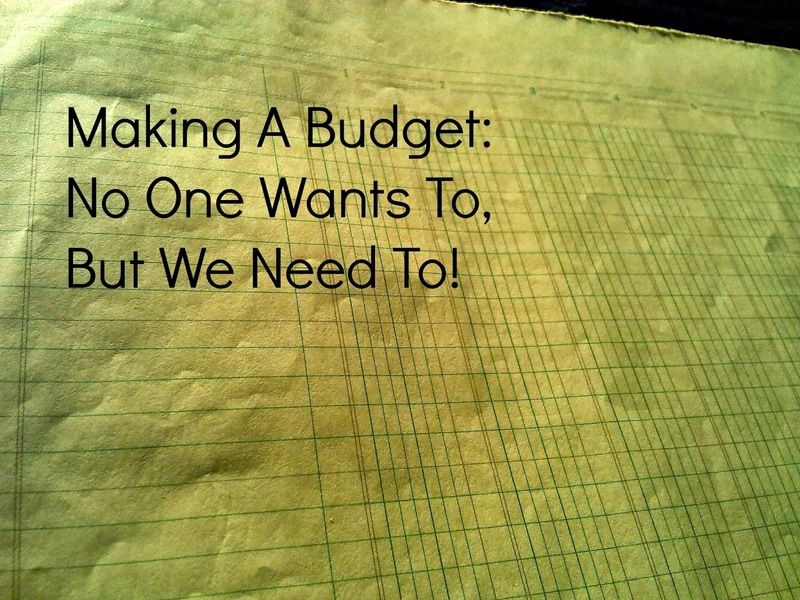 Just so your budget is not in your head, but on paper or saved on a file. Seeing it on paper makes your budget real to you. Keeping it in your head means that your budget is abstract and easily adjusted to what whims can suddenly take place. Now, will this budget work exactly for the next and every month? Yes and no. If you have expenses that are the same every month, never vary, and no surprises occur, you will be golden. If you are like me, you will have expenses that change all the time, your kids will surprise you with new needs (thank you to schools), and can change mid-month. You will pull your hair in frustration or find the need to go target shooting. However, sit back and breathe deeply. Write every month down. Write down what expenses are the same every month. Estimate what you need to until you know the definite amount. You will have to adjust your budget for new things. You might find places you don't spend as much as you thought. You might have places you spend way more than you should. The next few months will be an adjustment period. Pretty soon, you will have a working budget. I promise. Having a budget though requires something else from you. Self-discipline and self-control. I can feel some of you cringing already. That is okay. I am too. This is where you may need and should have a budget accountability partner. What is a budget accountability partner? Someone you can trust to bounce ideas off of, cry on their shoulder when the budget is not responding to your needs/wants, and someone who will help you take a cold, hard look at it. Make sure your budget accountability partner is someone you trust. A spouse, significant other, parent, family, or really good friend are all good candidates. If you are married and both of you have trouble with the budget, finding a parent, sibling, or really good friend would be good. Some people do find it beneficial to find a professional to help them be accountable and that is fine too. Whatever it takes for you to make your budget work! I feel this year will be a year that our money will have to go farther and farther yet. Now is the time to take charge of your money, make it go farther, and make it work for you! 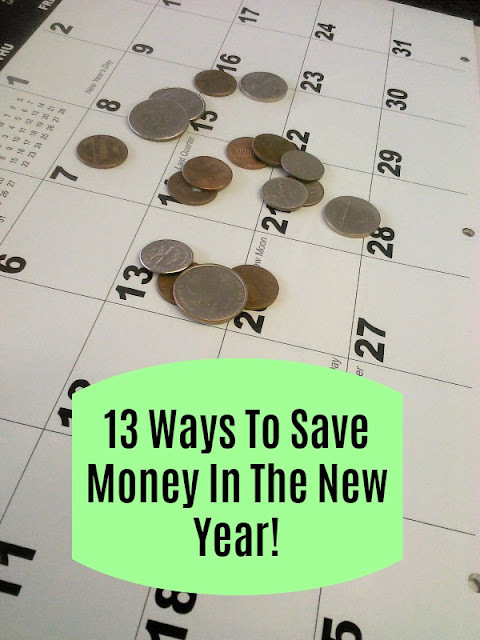 13 Ways To Save Money In The New Year! A new year and new goals! Yes! One of my goals for the year is to live as frugal of a life as possible. What I was really saying is that we are going on a spending fast. We literally will be cutting back expenses and saving money as much as possible. My finances are not where I want them to be and I need to change that. What will I be doing to save money in the new year? 1. Unsubscribe to all or all but a few (3-4) emails a day that encourage me to part with my money. Most of the time, I just delete the emails before I read them, but I have moments of weakness and click on them. No more! 2. Commit to spending no money for anything not on the goals list, that is frivolous, or unnecessary. 3. Write out your goals to know where the money needs to go and what needs to save for. Where does your money need to go? What are your goals for the year? 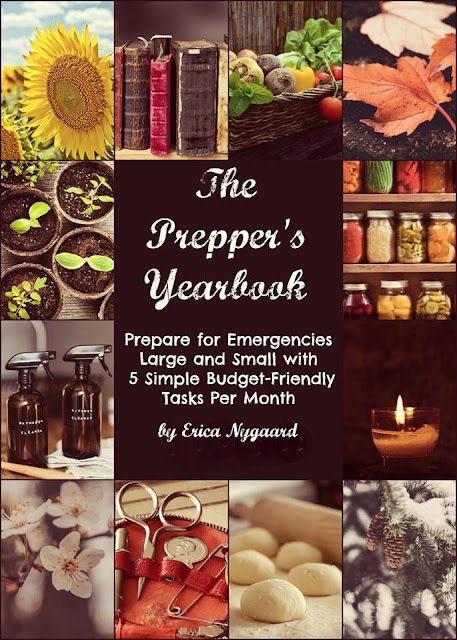 Think about the areas of the home/homestead, prepping, financial, gardening, and kids. Set a plan for those goals and how to attain them. Check out my goals here! 4. Commit to becoming debt free. This is a hard one. I know first hand and am still struggling to become debt free. 5. Spend less than what is earned. Easier said than done, but self-discipline is crucial. 6. Learn to live on cash. 7. Talk yourself out of purchases. 8. Subscribe to frugally-minded blogs and newsletters for encouragement. 9. Look for money making opportunities to help pay for projects or pay towards debt. 10. Learn to live without things. "Make do, do without, use it up, wear it out!" 11. Stretch a dollar and make your money go as far as possible. 12. Give yourself some grace. Life is unpredictable and some things are out of our control. Pick yourself back up and get back on track. 13. Find some friends, significant other, and/or family to become an accountability partner. Find similar minded people to talk to and bounce ideas off of. I talk about this and budgeting in this post! Each month from here until December, I will be talking about each of these in great length. Money is important, but should not rule our lives. Make this the year where you take back control! Are You Setting Goals For 2015? Here Are My Goals For 2015! The year 2014 is almost over. Thank goodness. This year has had its high times as well as its low times. I started raising chickens and getting eggs. Woo hoo! This blog has gotten bigger and better. Another woo hoo! However, I felt lost most of the year. Not cool. I realized when I looked back over the year that I did not set any real goals, commit any dreams to paper, and had no definitive plan for getting anything done. I think I might have gone on strike a year ago when it came to having goals - something about them being stupid, unobtainable things. Yeah. Now I am back on track and have realized the foolishness of my ways. Goals are good. Goals are great. Hooray for goals! I have set for myself twelve goals for the year 2015 that I hope to accomplish. I will take you on the journey with me and update you every month. Total transparency and all that. How do you know I am serious? I have already set up the blog posts for the first of the month. Every month through December. Lucky you. These goals will cover the home and homestead, prepping, and personal things I would like to accomplish. Some are big things, some are small things, and some are bit out there for me. Do I have more goals? Yes, but I told you all I would be realistic. This is mostly realistic. 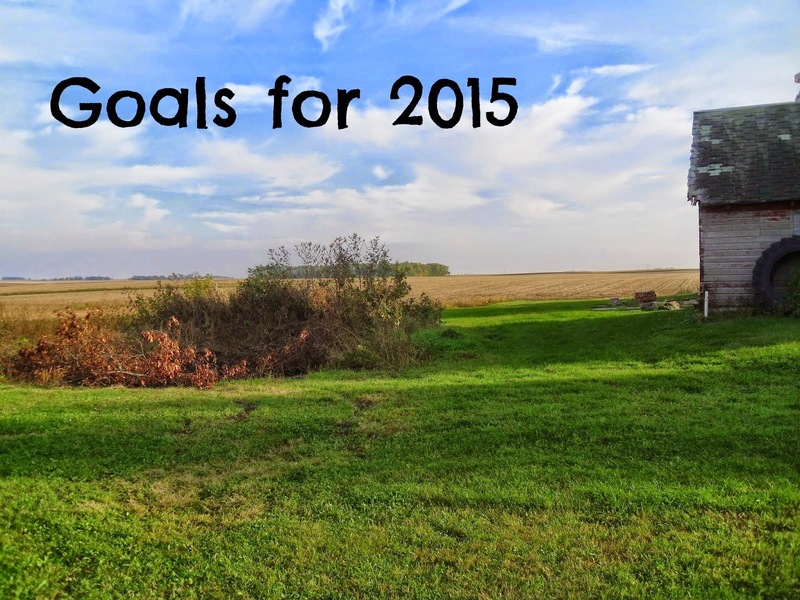 Now I want to know: What are your goals for 2015? Please post below! Garden Plans and Goals Update! With Spring coming in four days, I would like to start giving regular updates on the progress of the garden this year. I will also share my frustrations too, but I would like to be positive about gardening. Gardening is therapy for me and I want to be an encouragement to all of you! I plan on sharing my progress through my goals and plans as well as what I have gotten accomplished. As of right now, that is not a lot due to snow, snow melting, and muddiness right now! 1. Buy a rear-tined tiller. My ground gets very hard even with the additional soil conditioners. A tiller will be a gift from heaven. Especially if I can find one that I can start easily. Not yet, but soon! I am researching and patiently waiting for an used one. A new one costs $500-600 and that just makes me cringe to spend that kind of money! 2. Adding in more peat moss and compost to nourish the garden. 3. Buying biodegradable plastic or material that will block the weeds in between rows. I will also be adding mulch on top of this to further choke out weeds. Done, done, and done! I bought three rolls of 45' x 3' rolls of weed blocking fabric for the garden! I might need more mulch, but I have five bags of it left from last year. 4. Move the raspberries out of the regular garden. 5. Adding two raised beds outside of the garden. One bed will be for asparagus and the other will be for the transplanted raspberries. The raspberry bed will be 12' x 6'. I haven't quite worked out the dimensions for the asparagus bed yet, but I am thinking an 12' x 4' bed. Better get cracking on the asparagus bed! Those crowns will be coming soon! 6. Planting tomatoes in the regular garden this year instead of buckets. I will be planting 16 plants. I am borrowing an idea from a friend and using fence to support them. I may keep a few in tomato cages too such as the grape tomatoes. 7. Planting four blueberry bushes. I am looking at two different varieties that are Zone 3 hardy. I am a very northern Zone 4 so I look for plants that survive in Zone 3. I will need to add aluminum sulfate when planting them, but I have hopes. I am still trying to decide exactly where to plant them. Maybe along side the barn? I better figure this out soon. I ordered four plants on Friday and they will be shipped out sometime in April along with the aluminum sulfate. 8. Starting asparagus this year. Since asparagus will take 2-3 years to get established, I figured I better get this accomplished now. I ordered 10 crowns on Friday also. We will definitely be getting these started. 9. Expand the garden about five feet to the east. 10. Planting in the garden this year: spinach, kale, green beans, carrots, summer squash, onions, potatoes, three varieties of tomatoes, Anaheim peppers, and bell peppers in the actual garden. In four of the buckets, I will be trying cabbage for the first time. I am still not sure about the other four buckets, two big round containers, or three oblong planters. I want to try herbs, but I have not had a lot of luck with them in the past. I also want to leave some space for new and interesting things I find at the garden center! 11. I want to add a hose splitter and another sprinkler for watering. One sprinkler is not enough for the whole garden. Also, after the last few very dry summers, I need to get more serious about the watering issue. 12. Cut the tree down in the rhubarb patch. It is seriously starting to affect the rhubarb production. I don't want to use chemicals, but I will be using Tordon RTU on all the cut areas to kill the remaining stump. 13. Trim up the apple trees for a better production. We got an amazing amount of apples last year, but I would like a little bigger apples. 14. Leave the strawberry bed alone this year. It is at the end of my garden and doing okay for now. I would love to give them their own bed or space, but not this year. 15. Move the day lilies out of the edge of the garden. I have no idea as of yet where I want to put them, but I am thinking about where. Ahhh!!! I still don't know where to put them! Anyone want some daylilies!?!? That is it for now, folks! This year's garden is going to be super awesome! Well, it has to be better than last year. Last year was a pretty much a learning experience (i.e. a failure). I will be doing some things different and expanding a bit. I should be home more this summer since we do not have any more high school softball girls in the house. I will be contending with one in 7th grade softball and one in 3rd grade baseball. That shouldn't be so bad. Also we are looking at methods that will make gardening easier like keeping the weeds down with material and mulch. I realized that last year I did not post any gardening plans or goals. That may account for why I felt like a failure in the garden last year. After some solid learning experiences, I am learning to have plans and goals. They do give me something to work towards and keep me in line for the future. 1. Buy a rear-tined tiller. (Like this one.) My ground gets very hard even with the additional soil conditioners. A tiller will be a gift from heaven. Especially if I can find one that I can start easily. Some of my planning and moving things are due to the fact that they are big weed areas. I can't seem to keep on top of the weeds in the raspberries and day lilies which affect the whole garden. I hope by moving them out of there, I can effectively manage the weeds in the garden. I plan to mulch the beds that I move the raspberries and day lilies to so I can keep the weeds down there. We do plan to store, can, freeze, and dehydrate all that we can from the garden. This year we will be trying something new with the goods that produce more than we can use, but I will let you know more about that later! I want to get to the point of producing most of our own food, but that may take a few years and a lot of patience. I told you all I would try to keep you updated on my progress in 10 Days in July project list. This has been going okay. I would like to be further along, but I am happy with where I am. I am at least getting something done! 2. Clean and purge Paige's room. This will be a multi-day project. 3. Purge toys out of Dane's room. He has grown out of a lot of toys! 7. Find shelves or reorganize my office for the books I am selling on eBay. They are taking over my office! 9. Put a deadlock on the back door. I have one for each of the doors, but I figure I better start one at a time. 10. Make candles. I have had the stuff to do this for a year, but never have gotten them done. Here is the progress picture update! 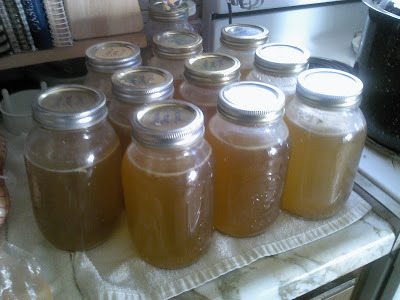 I got 10 quarts of chicken stock done. In a genius moment, I also canned up the frozen chicken stock from freezer so I could have more room in my freezer. Normally I only get 7 quarts when I make stock, but the addition of the frozen stock (heated up) I got 10 quarts. I tried a new recipe for chocolate syrup/sauce. I wanted more of a syrup so I didn't cook the syrup as long. The kids love to add it to their milk! I doubled the recipe and made 8 half-pints. However, I already gave one away and have one in the fridge. I didn't take a picture of the loveseat, but I ended up using bricks on the leg that broke. I tried to repair the leg of the loveseat, but it was too far gone. What have you gotten accomplished with your project list? A bucket list, you say? You bet! I like life a little better if I have a list of things I would like to do and learn and see. I live pretty much day-to-day so this gives me ideas on what I want to accomplish. To me, a bucket list is just not a wishlist, but a list of things I want to accomplish that seem a little out of reach at the moment. I need to put in the hard work, have discipline and focus, and a lot of fun trying to accomplish them. 2. Sew something like a skirt for Jordan. 4. Go to Las Vegas. I have always wanted to. 5. Decorate the walls in my room. 6. Start using my fire pit more. 7. Take my kids on more day trips like to the aquarium in Dubuque and the Science Center in Des Moines. 8. Take the girls to the Renaissance Faire in Shakopee. 9. Read the Bible and the Story of God from start to finish. 10. Watch a NASCAR race in person. 11. Concentrate on being happy and grateful. 13. Work on being a better parent at home by being more involved. 14. Replace and paint the walls in the front entry and back entry of the house. 15. Work harder on looking for the good in others and only speaking well of others. 17. 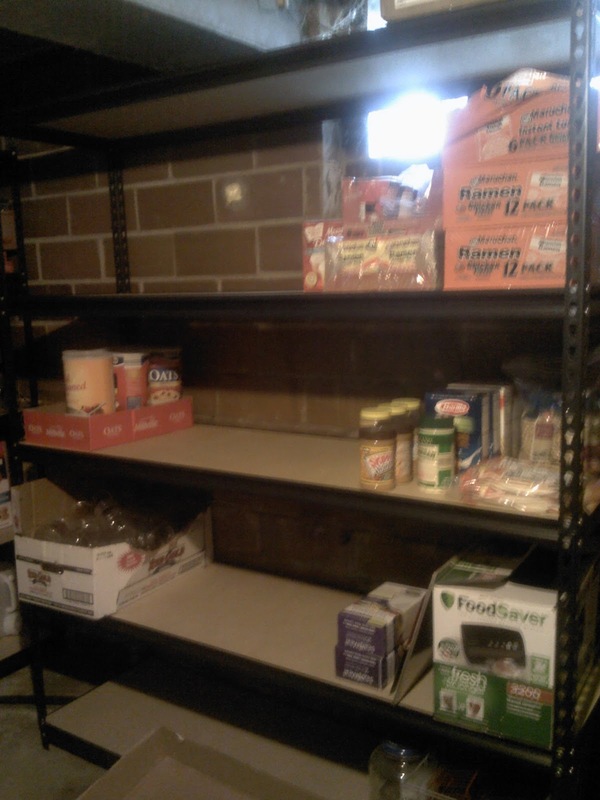 Expand my food pantry. 18. Purchase and put up curtains on every window in the house. 19. Can salsa and marinara sauce. Both seem a little intimidating. 20. Break my sugar and soda habits. Join me in making your own bucket lists! You will be amazed at what you can think of! I know, I know. Winter is barely here and I am already thinking about my garden. I am not crazy. I just need something to get me through the winter! Actually my 2012 Gardening Goals have a purpose. I am trying to plan to be more self-sufficient and raise my own food. Therefore, I need goals and I need to have a plan. This is not an easy thing to do. I need to decide what I am trying to accomplish and what I want to store and can. This coming gardening season is going to be concentrated more on root vegetables and easy to can produce. 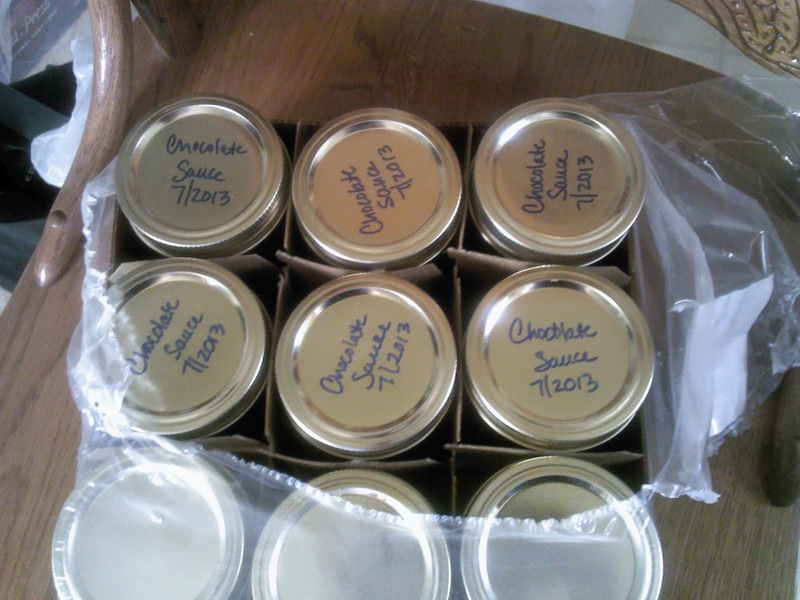 I just don't have the time in the summer to be canning complicated goods although I really want to! 1. Plant three rows of potatoes this year instead of two rows. Two was not enough. I am not sure three will be either, but I need to expand slowly. 2. Plant 6-8 hills of sweet potatoes. This will be a new crop for us this year. 3. Try growing peas and pole beans along side the barn this year to free up space in the garden. This will mean I need to (A) put a long trellis up or (B) invest in some cattle fence and posts for the peas and beans to grow up. 4. Successfully grow onions that are bigger than a shooter marble. 5. Successfully grow and nuture tomatoes. 6. Cut the raspberry canes ASAP this spring and replant the raspberries so they look a little less wild. 7. Cut down and kill the tree growing in my rhubarb. 10. Implement a very effective mulching and/or natural weed prevention program. 11. Plant kidney beans to dry and to can. 12. Plant pinto beans to make my own chili beans and to dry. 13. Make weeding a twice a week habit. 14. Get a whole lot more serious about producing our own food and preserving it. 17. Use more container gardening for herbs, squash plants, and peppers. 18. Finish reading Gardening When It Counts by Steve Solomon. 19. Add compost to my garden this year. 20. Possibly move strawberries to a raised bed by the garden. The raised bed would need to be built first. 21. Attempt to grow more heirloom varieties so I can start saving seeds. Question though: Are Yukon Gold Potatoes heirloom? I really like them. 22. Buy my own rear-tined tiller. 23. Enlarge my garden by five feet to the east and to the south. 24. Install a rainwater collection system on barn to get a closer water source to the garden. 25. Buy a decent water sprinkler for the garden. Some of these goals are pretty lofty, but most are very doable. I can't wait for Spring to arrive! Are you a goals person? Are you a goals person? You know the type. They are able to set short-term and long-term goals. They are able to focus on those goals and actually accomplish them. I am not this type of person. I never have been. I used to view goals as a way to let myself down because I would be upset if I did not accomplish them. And really, who needs that kind of stress anyway? Well, I need to become that kind of person. This year, I did discover that to-do lists were actually a good thing. They gave me focus. They helped me remember what I needed to on a daily basis. They helped my memory out in ways that can only be imagined! I realized that to-do lists are actually just short-term goals and I can accomplish them. If I don't get them done, no biggie. I just add them to tomorrow's list. It is all good. This has helped my focus out in many ways. To-do lists have convinced me that I can set long-term goals as well as short-term goals. I have the focus and discipline to accomplish this. And maybe I don't have adult ADD. I was starting to wonder. A huge benefit to setting goals and making to-do lists? I have found out I save money by doing this. What you say? I save money. I know what I need to buy now. I am looking for ways to make projects cheaper because I know they are goals I want to accomplish. I look at what I have first before I buy because I have researched my goals and I know what I need. I don't stand at Menards wondering what I need because I have a list. Although I doubt that this will be cured altogether. I like wandering around Menards aimlessly. I get ideas that way. I am starting to make lists for my goals. I want to share them with you to help you as well as me. You know what they say about accountability. With this blog, I consider myself to be accountable to you all. So that is what I will be doing for the next week. Sharing my goals, hopes and dreams. Hopefully not setting myself up to fail. I can be good at that too.